LAS VEGAS – September 12, 2018 – Barrett-Jackson continues building an impressive docket with the addition of 25 cars from the Bryan Frank Collection for the 2018 Las Vegas Auction, September 27-29, 2018, at the Mandalay Bay Resort and Casino. The collection adds to an already impressive docket for the 11th annual auction in Las Vegas, which also includes the John Staluppi Jr. Collection. Among the feature cars in the collection of Bryan Frank – who will also be bringing more of his collection to the 2019 Scottsdale Auction – are a ’53 Buick Skylark Convertible (Lot #665.1) and ’58 Chevrolet Corvette “Fuelie” Convertible (Lot #665). 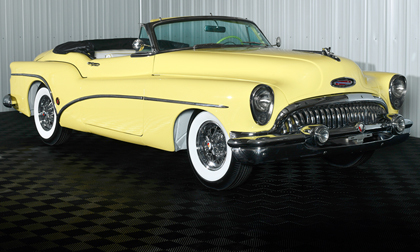 One of only 1,690 built, the yellow-on-yellow ’53 Buick Skylark Convertible (Lot #665.1) is powered by a 322ci Nailhead V8 engine paired with an automatic transmission. The vehicle went through a comprehensive restoration several years ago and features power windows and steering, radio and a power seat. The ’58 Corvette “Fuelie” Convertible (Lot #665) is finished in the beautiful color combination of red with white contrasting coves and a red interior. It is powered by a 283/250hp fuel-injected engine mated to a 4-speed manual transmission, and includes windshield washers, wide whitewall bias-ply tires and courtesy light, along with a white convertible soft-top. In addition to the Corvette “Fuelie,” the collection provides a wide selection of Chevys, including a stunning ’58 Impala (Lot #663) finished in silver blue with a tri-tone turquoise interior. It is the product of a frame-off restoration to factory original specifications and features a triple-carbureted 348ci V8 engine with a Powerglide automatic transmission. Lot 663.1 is a ’62 Chevy Impala Custom Roadster finished in Galapagos Green with a soft light green interior. Originally a hardtop, it was converted to a roadster that includes custom-designed glass and a 1950 Chevrolet dash that was widened 8 inches, and also features handmade trim and one-off gauges. The 2018 Las Vegas Auction Docket is now live. Advance tickets and All-Week ticket packages are also available at Barrett-Jackson.com. Consignments are being accepted for the 2018 Las Vegas Auction; to submit an application, click here. For information on becoming a bidder, visit www.Barrett-Jackson.com/bid. Also, follow Barrett-Jackson on Facebook, Instagram, LinkedIn and Twitter for the latest news and information heading into the 2018 Las Vegas Auction.